It’s all about the clean skin; if it’s not clean then your skin will not perform the way you want it to. If you want to have a natural bare looking skin, it’s just got to be clean. If you want to use makeup to have some coverage it’s just got to be clean to allow the makeup or tint to look flawless. We say this so many times, you need to cleanse the skin twice, once to remove the dirt….. Wait a minute, we don’t need to say this anymore here is Dermalogica® with PreCleanse. 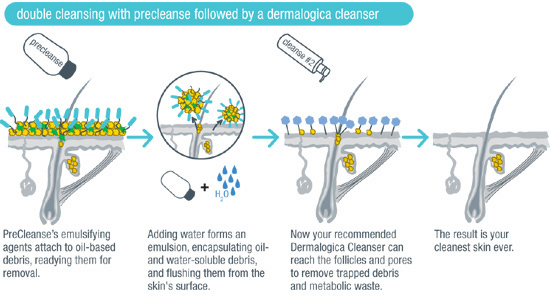 Dermalogica is about to change the way the world cleanses with PreCleanse. With today’s long-lasting, longer-wear, “indelible” cosmetics, and speedy skin care regimens (the average person spends less than 20 seconds cleansing!) skin care problems such as clogged pores, dull skin and blackheads are practically inevitable. Professional skin therapists recognize the fact that clean skin is the foundation for a healthy, great-looking complexion. So it’s not surprising that the professional skin experts at The International DermalInstitute recognized the need for a deeper level of clean and created PreCleanse! This PreCleanse method is based on the technique practiced by professional skin therapists, “double cleansing” provides a deeper, more thorough cleansing – essential in removing today’s longer-lasting cosmetic formulations, water-resistant sunscreens, pollutants and skin’s own sebum. This is so important, if you consider the strength that a water-resistant sunscreen has you need to match it with a cleanser that can break down that chemical formulation to get to your actual skin. Here is where Dermalogica understands that their followers may need a reminder of the road map, after all Dermalogica® believes in MAPPINGand they want you to keep on track. Having a PreCleanse in the regime is the reminder that you will get all the dirty chemicals grime and build up off of your skin before you actually get to the actual skin to be cleansed. 1) Remove eye and lip make-up by dispensing PreCleanse onto damp cotton pad. 2) Shake a generous amount of PreCleanse into dry hands and spread between the palms. 3) Stroke PreCleanse onto neck, cheeks and then forehead. a. Begin the Double Cleanse by starting at the neck and spreading product across the face with light, upward movements. b. Continue by circling chin and cheeks, paying special attention to congested areas. c. Use one fingertip on both sides of the nostril, and then circle around the side and top of the nose. d. Come between the eyebrows and continue circles over forehead, making sure to include the hairline. e. Wet hands and massage over PreCleanse to create a light, milky emulsion. 4) Remove with warm water. 5) Commence second cleanse with recommended Dermalogica cleanser.